Welcome to the Baptist Hospitality House! The Baptist Hospitality House is not available for use at this time. Please check back again. In the meantime, please try one of the other hospitality services referenced on our Other Ministries page. 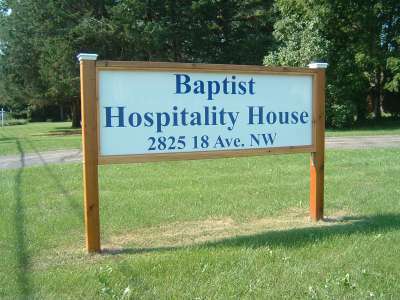 The Baptist Hospitality House is a lodging ministry to patients and their families visiting the Mayo Clinic and its hospitals. Our ministry is to meet the spiritual, emotional, and physical needs of our guests. Please let us know how we may serve you. We care about everyone who comes to Mayo Clinic for medical treatment. The Baptist Hospitality House is owned by and located adjacent to Emmanuel Baptist Church (SBC). For more information, use the navigation bar on the left to read about our Accommodations and Ministry Guidelines.